The Computer Lock Up application was developed to be a small tool that will lock your PC when leaving it and prevent unauthorized access! 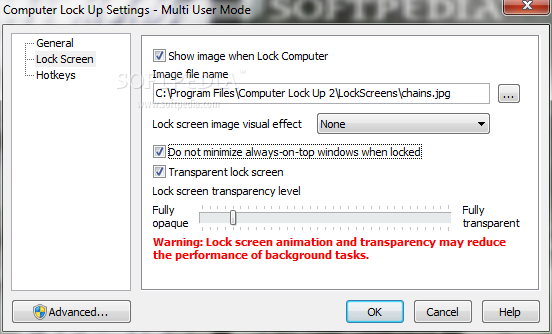 Set the unlock password that cannot be bypassed in safe mode or ignored by a user with administrative rights. The smart software locks keyboard shortcuts, mouse, CD/DVD drives and screen. Protect your PC from unauthorized usage !Whether you want to lock out snooping co-workers, protect yourself from data leaks, or make sure your unsaved work won't be lost - Computer Lock Up is exactly what you need. Set the unlock password and enjoy the new level of security! The software offers advanced capabilities beyond the basic access restriction, which include locking keyboard shortcuts, mouse, CD/DVD drives and screen. Thanks to these features you can now leave your computer unguarded in a room with your toddler or pet without worrying about coming back to an awkward Facebook status or a data disaster. Best way to lock your computer safely !Unlike the basic Win+L, Computer Lock Up won't let a user with administrative privileges invade your privacy and interfere with your work unlocking your PC. The program has all the security loopholes closed, ensuring that nobody - and not even administrator - can use your computer without providing the correct unlock password you've set. With Computer Lock Up there is only one password and you are the only one who knows it. Lock out snooping co-workers !To protect your privacy even further, the software features startup lock option allowing you (as the name implies) to lock your computer at startup. Such a lock cannot be bypassed in safe mode, so you can be sure that some casual snooper won't be able to read your email or pull a prank on you using this little trick. What's more, the smart program will notify you if someone has tried to break in. Protect your privacy and avoid data disaster !With Computer Lock Up it is easy to check if anybody tried to login while you could not see it. 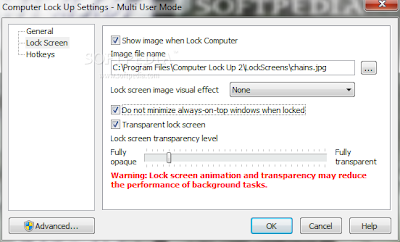 You can also hide password promt box for so-called "blind" unlocking, turn on automatic lock under certain conditions, use multi-user (corporate) mode and enjoy other benefits. Your computer can also be transformed into a presentation machine if you choose to create cycling lock screen images.